Nsala soup also known as "Ofe Nsala" by the igbos, "Afia efere" by the Calabar people and "White soup" in English is a very popular delicacy in the eastern and southern parts of Nigeria. It's is known as white soup because this is one of the major Nigerian soups that doesn't require palm oil though some people add very little sometimes. It is also one of the easiest one pot soups I enjoy making. Before making this soup, I'd prepared my mind that I was going all Traditional with the preparation starting from the mouth watering pounded yam swallow which is the perfect side dish for the Soup to the pounding of the local spices such as Ata rodo "scotch bonnet", Mpkuru uziza seeds, Uda seeds e.t.c. After making this soup, deep within me I knew I had done something right. This was because the whole pot of soup was Used up in one night...lol! The whole Fam kept thanking me even till the next day. This soup would definitely get everyone asking for more. Igbo style white soup. Made without palmoil. Perfect when served hot with pounded yam. • 2 Scotch Bonnets "Atarodo"
• 10 Uziza leaves "False cubeb"
For this soup any type of meat or seafood can be used. 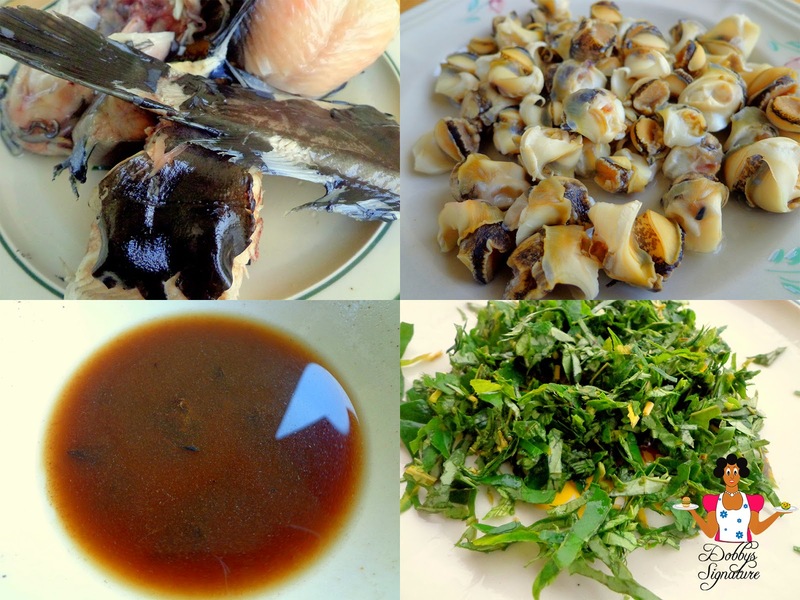 For this, i made use of Red beef and sea foods like Stock fish, Dry Fish, White Periwinkles "Ngoloo(igbo)/ Ngongo (Crossriver) and Catfish ". • To prepare the stock fish and dry fish, soak them both in hot water for about 5 mins till they regain moisture and soften. Remove the bones from the dry fish, Rinse the stock fish and dry fish - set aside. • To prepare the periwinkles, Remove the eyes and gut of the periwinkles, Rinse - set aside. For this recipe, i made use of just Ngoloo which is the white periwinkles. For this soup, you can make use of any type of ogiri such as Ogiri egusi, Ogiri Okpei and Dawadawa. For the Igbos, Ogiri Egusi is mostly preferred because of it's very strong Aroma but if you don't have it, you could simply use Ogiri okpei(Igbo) or dawadawa(Hausa). For this, i used Ogiri Okpei which i Simply dissolved in a little amount in water & then set aside. Step 1: Place the Red beef in a medium sized pot and add a little water just enough to go half way through the beef in the pot. Add the pounded or blended onion and pepper, salt and stock cubes. cook for about 15 mins till a little bit tender. Step 3: Once it starts to boil, Add the tablespoons of pounded yam, stir and cover the pot. The yam would dissolve and thicken the soup. Leave to cook for about 10 mins till it starts to boil and you are satisfied with the thickness. You could add more yam if you want it a little bit thicker. Chei! Dobby oooo! You have to come and do omugwo for me! Ada oma osite ji si ike. Ofe Nsala and pounded yam is one of my best meal. I'll make it over the weekend. Can I replace the yam with cocoyam as a thickner instead? Cocoyam is a good thickner for bitterleaf soup. Dobby, I'm salivating already. You are GOOD. More power to your elbow. My first time visiting this blog and I'm loving it already. Where have I been? I just stumbled on this blog on wives connection. Dis is my goto blog henceforth. Ur blog is totally awesome. I'll try as much recipes as I can. Pls kindly visit n follow my blog. .. www.makeupcubicle.blogspot.com . Ur comments will b highly appreciated. Thank you cyndy. Glad to have you here. When boiling d beef is it necessary to put d pounded yam? Can one just boil the beef the normal way with the curry and thyme n then put the pounded yam later while addin oda ingredients? Yes you can boil the beef the normal way but with the stock fish and dry fish. The pounded yam can come later. Please can I cook Nsala soup with achi? yes achi can be used for thickening but yam is the major thickener mostly used. Girl you got me salivating!! I've never had this meal before but I'm certain it's delicious!! My first time visiting this blog and I'm loving it already. Am salivating already. Pls can I use any other fresh fish apart from cat fish. I don't really like cat fish. But needs to cook this soup urgently for my husband. Yes you can use any other fresh fish apart from catfish to cook this. Hi dobby! I just tried this recipe and it came out wonderfully. What better meal to prepare for my hubby on his bday today. Tnx for helping a sister out. you're welcome Margaret< Thanks for the feedback. Hi Ifeoma, Currently i don't but i'm working on it.